1. 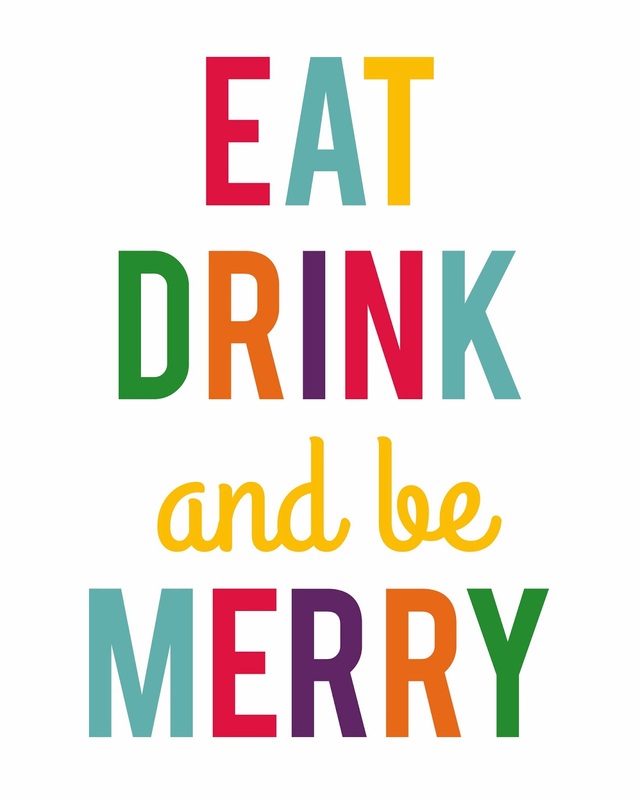 How much fun is this free "Eat, Drink and be Merry" printable from Two Twenty One? I think it would look great printed and framed on a bar cart (obviously), on an entrance table to greet your guests, or on a buffet station. It's also available in all red or all green, if the multi-colored version is a little too bright for you. 2. I assume that around this time everyone is gift wrapping like crazy? Check out Style Me Pretty Living's guide to How to Wrap the Perfect Gift and Minted's guide to How to Tie the Perfect Bow. Both great refreshers! 3. In case you are a late shopper and need to send some foodie gifts, my favorite market - and basically my second home - Foragers City Grocer has started shipping their products nationally. Everything I've ever bought there has been perfection. 4. Attending a holiday party and asked to bring an appetizer? The Effortless Chic put together a list of suggestions from several food blogs: The Best of the Holidays / Appetizers. 5. If you're hosting a dinner party over the holidays and need some inspiration, Apartment 34's advice regarding How to Set the Perfect Holiday Table is basically all you need. Beyond beautiful.